In recent years the amount of “Must have”-marketing software has grown explosively. It seems like every month new tools are developed that you as a marketing manager absolutely need to have. As a result it’s becoming harder and harder to make the right choices. What’s the right marketing software? Do you need an ESP, a CRM system, a Business Intelligence & Analytics solution or is a marketing automation or lead management system the right choice? The only way to get it right is to get back to the basis. In the end, as a marketer you need to optimise the communication streams with your customer. This makes the communication more effective and / or more efficient. Therefore, the choice of marketing software has to be determined by the process elements you wish to optimise. If your primary goal is to generate leads for your sales team in an efficient manner, you’ll have to choose a different solution than in the case where your objective is to implement personalisation techniques in your responsive website. Is the communication process that’s supported a 1-to-1 process or N-to-N by using tools and applying business rules. This diagram shows that every company essentially has 4 classes of communication needs. What’s more, every company meets these needs one way or another. Very often, some of the needs are not supported by technology, meaning that the company has to fulfil the needs by manual and inefficient processes. The fact that these processes are identified as inefficient is most often the main driver that leads to the development of new marketing software. Data related marketing software can therefore be classified in the same domains as well. environments like Sharepoint and Intranet. All of these tools fulfil their own roles and are important in their own right. It is not uncommon within organisations to have each of these technologies implemented side by side, complementing each other in the communication process. Which marketing software is essential? Needs are fundamental. You don´t choose them, they manifest themselves over time when a company develops and determines how it wants to service its markets. Therefore all marketing technology is developed to meet those needs and make the marketers’ work more efficient. Now imagine what would happen if your company missed some of the tools shown above. The automatic consequence would be that the related communication needs would either need to be met by a tool that’s not designed for that purpose or it would need to be supported manually. Anyone who has ever been in such a position will be able to confirm that these are very painful situations that make your work a lot less enjoyable. How do you choose the right marketing software? 1. Which need are you trying to meet? This is a great question to start your selection process. Many business start by defining which tools they want, and then afterwards are trying to fit their needs into the selected tools. That’s usually a recipe for disaster, since most software is designed for specific needs. Once you have selected a tool, it is usually very hard to switch again, both from an organisational and from a technological perspective. A recent study by Experian showed that historic choices for the wrong tools are perceived as the number 1 bottleneck to marketers for deploying their marketing strategies. A quick initial selection of tools can be made by looking at the responsibilities of the requestor of tools: data integration and reporting are usually the IT / business intelligence department´s needs. So they are likely to require data warehousing or BI technology. A CRM manager manages all personal interactions between front end + back end staff members and the clients, whereas marketing managers usually require tools to manage large quantities of communications, segmented by various kinds of data. 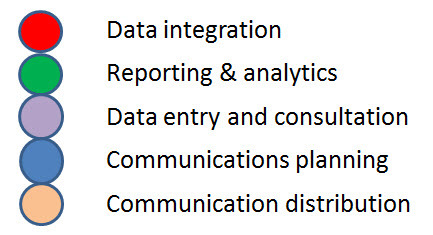 So analytics, planning, multichannel communication and multichannel data capture are key there. 2. What is the desired method to meet the need? It is important to remember that it is not mandatory to implement all tools or be active across all channels. Very often we see companies mistakenly investigating tools because “everyone else is doing it too”. The important question to ask here is what the recipient wants. If you’re reporting internally, your audience expects you to send information in a fixed format and fixed frequency. That’s a completely different need than the one where you are trying to seduce an external recipient to digest the information you decided is appropriate for them. Your audience dictates which channels you must use. Their preferences determine frequency, format, design and design flexibility, timing, experience, tone of voice, etc. etc. If that means that you end up incorporating online and offline, so be it. Today’s customer still has a high appreciation for traditional (i.e anonymous) channels like the store or door to door leaflets. At the same time, accessing a consumer’s private mobile or social space needs to be planned with care, as perceived intrusiveness usually backfires. 3. 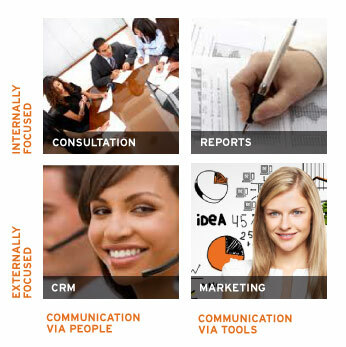 Which type of marketing software supplier meets your need? Ok, now you know what you need and how you want to meet your need. Which suppliers can help you best with that? The current abundancy of marketing software suppliers suggests that we’re facing an unstructured overload in possibilities. However, as a rule of thumb you can use the following rules (a simplification of course, but thinking in models is always a simplification of reality). If the word “Data warehouse” is used, a supplier usually is great in meeting the needs of IT / controllers. The main applications are integration of internal data for reporting purposes. Most Big Data matters end up with IT as well. Remember that only a very small proportion of Big data applications are marketing related. Words like CRM, marketing automation, sales enablement or lead management relate to processes where individual staff members are expected to have individual contacts with individual customers. These staff members can be sales people but also implementation or back-office members. Large amounts of staff members being able to view and modify individual customer data is the main requirement here. If the tool has a name that contains a communication channel (email, app, social, display, video, community, game, etc.) it usually is software developed for the marketer who is responsible for marketing execution / marketing communication and distribution. This can take shape in the form of (triggered) campaigns to individuals but sometimes also mass communication. More and more, tools need to support interactive contacts and personalised communication that is managed or delivered by the tool rather than a person. Marketing data, analytics, modelling, predictions, determining and implementing business rules to be relevant at the right time with the right message through the right channels takes place in a Marketing Database. This is the marketers’ domain. 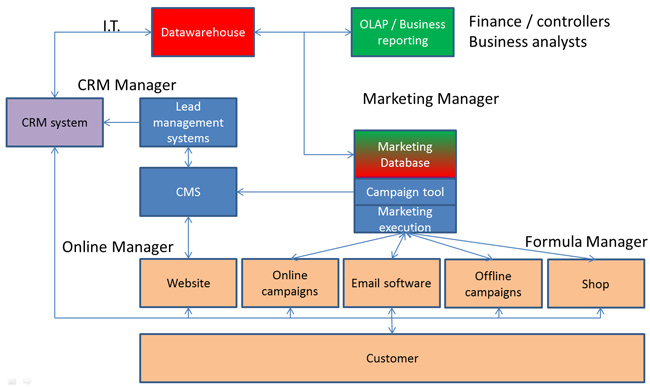 A marketing database can be used to monitor the effectivenes of campaigns over time and provides learnings and insights that help optimise future programs. By definition this is a very flexible environment, used to support external communication processes. Business analytics, dashboarding and data visualization are tools designed to meet internal communication needs, often in a reporting context. Most often these tools are the domain of the financial or business controller. The marketing software landscape seems to get more complex every month. However, differentiating communication needs in the dimensions internal / external vs 1:1 / N:N is a very efficient way to simplify the playing field. And by matching suppliers to your business needs and methods on these dimensions, selecting the right type of supplier becomes much easier. With the right choices for methods and tools you will be able to make fast progress in implementing your marketing vision, regardless the size of your marketing budget.